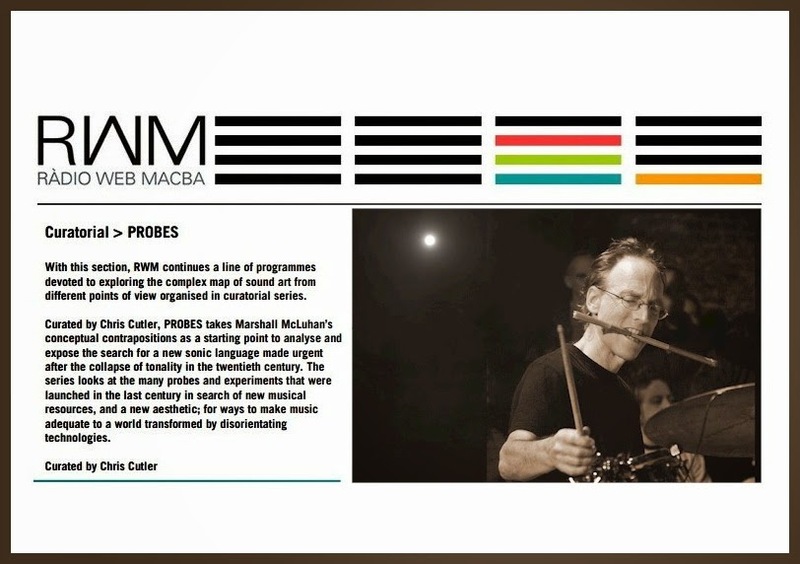 Prosegue presso l'emittente catalana non-profit Ràdio Web Macba, emanazione del Museu d'Art Contemporani di Barcellona, la pubblicazione dell'eccellente serie Probes, un'acuta indagine nei linguaggi della musica contemporanea curata e prodotta da Chris Cutler. Proposti all'ascolto nel più recente episodio - il nono, dedicato principalmente a fiati e percussioni - ci sono esempi dal lavoro di Evan Parker, Roscoe Mitchell, Luciano Berio, George Crumb, Alvin Lucier, Rahsaan Roland Kirk, Pharoah Sanders, Sun Ra Arkestra, John Zorn, John Butcher, Bob Drake, Tim Hodgkinson e molti molti altri. In the late nineteenth century two facts conspired to change the face of music: the collapse of common practice tonality (which overturned the certainties underpinning the world of art music), and the invention of a revolutionary new form of memory, sound recording (which redefined and greatly empowered the world of popular music). A tidal wave of probes and experiments into new musical resources and new organisational practices ploughed through both disciplines, bringing parts of each onto shared terrain before rolling on to underpin a new aesthetics able to follow sound and its manipulations beyond the narrow confines of 'music'. This series tries analytically to trace and explain these developments, and to show how, and why, both musical and post-musical genres take the forms they do. Probes #9 looks at some of the more oblique and extreme performance techniques applied to wind instruments and percussion.